From festivals to live music, fishing to agriculture, we have the perfect special event planned for your family this summer – so come on out and make some memories! If you have any questions about our special events, please contact Zoe Southlynn-Savage or call 217-819-3931 unless otherwise noted. All outdoor events are subject to weather cancellations and other delays. For weather-related closures or other program delays or cancellations, please visit our Cancellations Page or call 217-805-4100 for automated updates. Join us for live local music in the streets of Downtown Champaign and listen to some great CU talent on June 8 & July 13, 2019. For more information, please visit the StreetFest webpage. Join us for Champaign-Urbana Days (CU Days) at Douglass Park on August 9 & 10, 2019! For more information, please visit the CU Days webpage. Join us at West Side Park on August 16 & 17, 2019 for the Taste of Champaign Urbana festival! For more information, please visit the Taste of CU webpage. Sounds at Sunset Concert Series – FREE! This summer gather your friends, family, and neighbors as we host the Sounds at Sunset events throughout Champaign. Audience members are encouraged to bring lawn chairs and refreshments. Find us at a park near you! Hessel Park Concerts – FREE! Join us the first Saturday of the month this summer at Hessel Park for live local music. Neighborhood Summer Block Parties – FREE! We are bringing the party to your neighborhood! Join us at the neighborhoods listed below for Block Party fun! Inflatables, face painting, lawn games, live performances including CUperStars, interactive music by DJ Fireproof, and many more activities will be available for all to enjoy, so mark these Thursday dates! Ages 6-12 Adult supervision is required. 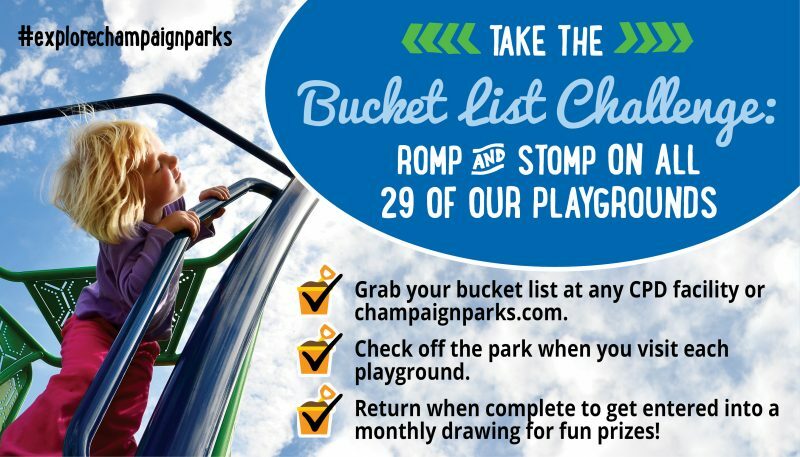 Co-sponsored by the Optimist Club of Champaign-Urbana for children who love to fish! Prizes will be awarded and a free hot dog lunch will be served. Bring your own fishing tackle – bait will be provided. A parent/guardian should accompany their child(ren) and fill out a permission form for each participant, available on-site the day of the event. Juneteenth, the oldest known celebration commemorating the abolition of slavery in the United States, is one event you don’t want to miss. Enjoy music and visit different vendors while learning about this important holiday. Children can make arts and crafts, play on the bounce house and obstacle course, or get soaked in the Splash Pad. Join the Champaign Park District and the Champaign County Farm Bureau for Family Fun Ag Nights. Families can participate in games, educational activities, and explore farm equipment. A free dinner will be provided at limited availability – first come, first served. In the event of inclement weather, the event will be moved inside the designated area’s gymnasium. The Central Illinois Aerospace Model Rocket Club schedules launches twice a month, year-round, generally on the 2nd and 4th Saturdays. Most launches are held at Dodds Park, with occasional alternate locations. In addition there are special launches like our Great Annual Rocket Launch of 2019 on July 20 at Dodds Park! Bring your own model rocket and fly with us or just come out to watch hundreds of rockets being flown. For further information, call 217-359- 8225 or visit us online at ciarocketry.org. Sholem Aquatic Center hosts a variety of family-friendly events and programs throughout the summer. Please visit the Aquatics Events page for more details. The Springer Cultural Center hosts a variety of art exhibits, lunch concerts, and other cultural events throughout the year. Please visit the Cultural Arts page for more details.